A late penalty gave Bray a dramatic draw with Waterford while Dundalk strolled past Derry City in League of Ireland action this evening. Gary McCabe's 91st minute penalty gave Bray a much needed point in a 2-2 draw at the Carlisle Grounds after Courtney Duffus looked to have scored the winner for third place Waterford. Bray remain five points adrift of Limerick at the bottom of the League of Ireland table with the draw, while Waterford are now four points behind leaders Dundalk. Dundalk took a two-point lead at the top of the table with a comfortable 4-1 victory over Derry City at the Brandywell. 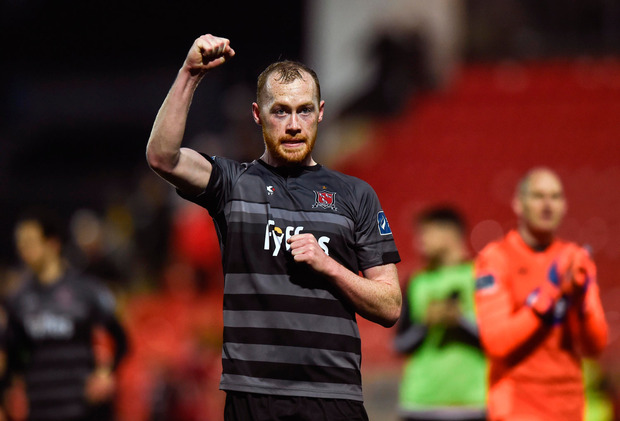 It was Derry who took the early lead through a 12th minute Darren Cole strike, but Dundalk drew level through Brian Gartland, and added three more goals to inflict the first home defeat of the season on Derry City. Dundalk now sit two points clear of Cork City in second place, who play Bray on Friday.